When the sun is out, grab the Madison D'Arcs cycling glasses with an included triple set of one-piece lenses for changeable conditions. Whilst great for cycling the Madison D-Arcs are quality sunnies for all outdoor activities in bright conditions. 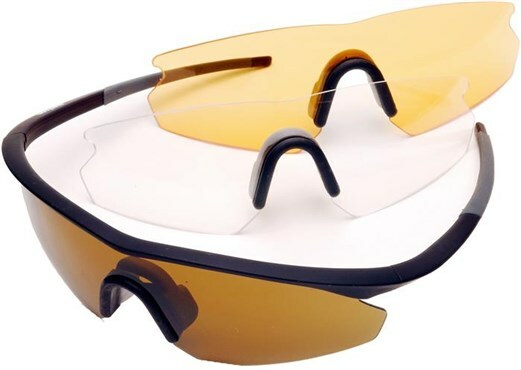 These cycling glasses are designed with a wrap around profile offering the best protection against glare and debris. The single piece lens also keeps elements and debris out. Choose the D'Arcs for everyday riding. Tick a lot of boxes! Excellent product for the price - am a fairly clumsy person not wanting to spend a lot of money only to damage expensive glasses, yet needing good protection/ventilation as am contact lens wearer and also I get hot in the face! These so far have been very good indeed and designed well to give good vision looking up/ahead when riding low, they stay in place and are very lightweight. I ride alone and am not trying to impress anyone with logos/labels, however! I have a few pairs of these glasses the lenses and frames are interchangable. The frames are soft and flexible and the arms can be snapped off intentionally so that the glasses can be packed down compactly in the soft carrying bag. The hard case they come in is totally over the top just pack them in hard plastic Mr Madison and reduce the cost! Great glasses that are tough & fit well. The changeable lenses mean great for any conditions. Have borrowed a friends for quite a while now so time to get my own! I recently lost my wrap around glasses and bought these as a replacement. You get a glasses case three lenses and soft case for half the price of an iridium lense. They fit better and sit more comfortably. They are amazing value and seeing the price for replacement parts I will never go back to the more expensive brand. Amazing glasses don't hesitate to buy.